Definition: A SLAP (“Superior Labrum Anterior and Posterior”) tear is an injury to the labrum of the shoulder, which is the ring of cartilage that surrounds the socket of the shoulder joint. 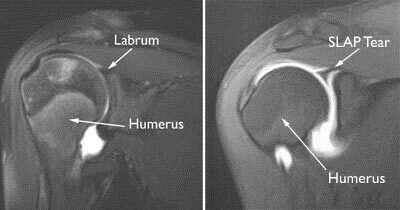 The labrum deepens the socket of the shoulder joint, making it a stronger fit for the head of the humerus. What is a SLAP – Tear? 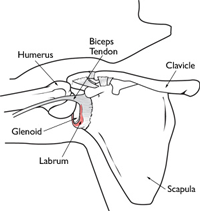 This cross-section view of the shoulder socket shows a typical SLAP tear. What causes a SLAP tear? 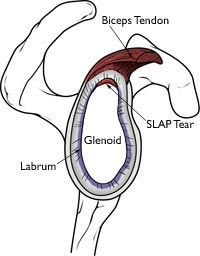 Many SLAP tears, however, are the result of wear and tear of the labrum that occurs slowly over time. In patients over 40 years of age, tearing or fraying of the superior labrum can be seen as a normal process of aging. This differs from an acute injury in a person under the age of 40. What are the symptoms of a SLAP tear? How will my doctor make a diagnosis of a SLAP Tear? Your doctor will take a detailed history of the mechanism of injury and medical history. Any work activities or sports that aggravate your shoulder are also important to mention, as well as the location of the pain, and what treatment, if any, you have had. He may perform specific tests by placing your arm in different positions to reproduce your symptoms. Your doctor may also examine your neck and head to make sure that your pain is not coming from a “pinched nerve”. The results of these tests will help your doctor decide if additional testing or imaging of your shoulder is necessary. What are the special tests that will help in diagnosing a SLAP tear? X-rays: This imaging test creates clear pictures of bone. The labrum of the shoulder is made of soft tissue so it will not show up on an x-ray. However, your doctor may order x-rays to make sure there are no other problems in your shoulder, such as arthritis or fractures. How do you treat SLAP tear? Physio-therapy. Specific exercises will restore movement and strengthen your shoulder.Flexibility and range-of-motion exercises will include stretching the shoulder capsule, which is the strong connective tissue that surrounds the joint. Exercises to strengthen the muscles that support your shoulder can relieve pain and prevent further injury. This exercise program can be continued anywhere from 3 to 6 months. Surgical Treatment: Recommended if your pain does not improve with nonsurgical methods. Arthroscopy: The surgical technique most commonly used for repairing a SLAP injury is arthroscopy. During arthroscopy, your surgeon inserts a small camera, called an arthroscope, into your shoulder joint. The camera displays pictures on a television screen, and your surgeon uses these images to guide miniature surgical instruments. Because the arthroscope and surgical instruments are thin, your surgeon can use very small incisions (cuts), rather than the larger incision needed for standard, open surgery. Repair options: There are several different types of SLAP tears. Your surgeon will determine how best to repair your SLAP injury once he or she sees it fully during arthroscopic surgery. This may require simply removing the torn part of the labrum, or reattaching the torn part using stitches. Some SLAP injuries require cutting the biceps tendon attachment. Your surgeon will decide the best repair option based upon the type of tear you have, as well as your age, activity level, and the presence of any other injuries seen during the surgery. Complications from shoulder arthroscopy are very rare. As with any surgery, however, there are some risks. These are usually minor and treatable. Potential problems with arthroscopy include infection, excessive bleeding, blood clots, shoulder stiffness, and damage to blood vessels or nerves. Dr van den Berg will discuss the possible complications with you before your operation. Rehabilitation: At first, the repair needs to be protected while the labrum heals. To keep your arm from moving, you will most likely use a sling for 4-6 weeks after surgery. How long you require a sling depends upon the severity of your injury. Once the initial pain and swelling has settled down, your doctor will start you on a physio therapy program that is tailored specifically to you and your injury.The therapy program focuses first on flexibility. Gentle stretches will improve your range of motion and prevent stiffness in your shoulder. As healing progresses, exercises to strengthen the shoulder muscles and the rotator cuff will gradually be added to your program. This typically occurs 4 to 6 weeks after surgery. What are the results of treatment of SLAP lesions? The majority of patients report improved shoulder strength and less pain after surgery for a SLAP tear. Because patients have varied health conditions, complete recovery time is different for everyone.